This graphic depicts the pulsar J1906 (at right with radio beams) and its companion star, with the curvature of spacetime in the region illustrated by a blue grid. This curvature has led to the pulsar's apparent disappearance in the sky, scientists say. Astronomers have watched a pulsar some 25,000 light-years from Earth slip from view, swallowed by a warp in the fabric of spacetime. This wacky effect is one more proof of Einstein's general theory of relativity, 100 years after publication. When a massive star runs out of fuel, it detonates, spitting gas and other debris with unimaginable violence. The supernova explosion is so powerful, that for days, or even weeks, it can outshine its host galaxy, beaming across the local universe. The calm after the storm reveals what's left behind, which might be an extremely dense neutron star, or even a black hole. These cosmic magnets emit two beams of radiation from their magnetic north and south poles. As they rotate, these beams might regularly sweep across the Earth, causing astronomers to see pulses of radiation just as we see flashes of light from a lighthouse. Most of the time, the pulses are so regular that you could set your watch by them. But the flashes from pulsar J1906 studied by Lorimer and colleagues are far from constant. The pulsar is a part of a rare binary system with a companion star thought to be either another neutron star or a white dwarf. Although roughly two-thirds of the stars in our galaxy are in binary systems, when a supernova goes off, it will give any nearby companion a powerful kick, often sending it into space at millions of miles per hour. But every now and then, pulsars manage to hang onto their companions, providing a rare glimpse into an exotic system. You can see a video of pulsar J1906 orbiting its companion here. Since its discovery in 2004 by the Arecibo Observatory in Puerto Rico, the system has been continuously studied by other powerful observatories. Overall astronomers have seen the pulsar rotate roughly one billion times over a five-year period. "These two stars each weigh more than the sun, but are still over 100 times closer together than the Earth is to the sun," co-author Ingrid Stairs, of the University of British Columbia, said in a statement. "The resulting extreme gravity causes many remarkable effects." The companion is so massive it creates a huge warp in the fabric of spacetime, like a bowling ball on a thin sheet. Once an orbit the pulsar falls into this warp, causing it to never return to the same spot twice, Lorimer said. Its spin axis shifts ever so slightly, and it precesses, or wobbles like a spinning top. This wobbling is known as "geodetic precession." "Imagine the lighthouse on the beach sort of tilting upwards and you no longer get that flash of light in your eyes anymore," said Lorimer. "It's pointing up at the sky. It's kind of like that here. The orientation of the pulsar is changing over time." Specifically, there's a 2.2-degree change in the orientation of the pulsar's spin axis per Earth year. 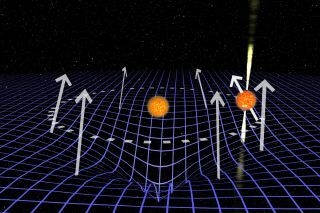 Anticipating this, astronomers raced to measure the binary pair's masses before the pulsar's flashes disappeared as predicted. "The pulsar is now all but invisible to even the largest telescopes on Earth," said lead author Joeri van Leeuwen, of the Netherlands Institute for Radio Astronomy, and the University of Amsterdam. "This is the first time such a young pulsar has disappeared through precession. Fortunately this cosmic spinning top is expected to wobble back into view, but it might take as long as 160 years." The results once again prove Einstein's general theory of relativity. Most physicists will agree that Albert Einstein's theory is "one of the most amazing physical theories of all time," said Lorimer. "It's basically an exercise in pure human thought. He had relatively few observations at the time to constrain the theory. But he had this amazing physical intuition. And all of his predictions that have been tested over the years have been verified to date."